"Superman Reborn" - Part 2/"The Man in the Purple Hat"
Lois and Superman head to DoppleClark's apartment in search of their son. The apartment is empty but soon DoppleClark arrives and Superman demands to know where Jon is. DoppleClark accuses Superman of leaving him all alone. He begins to transform into some of Superman's greatest enemies... Luthor... Bizarro... Brainiac... Mongul... Parasite... the Cyborg Superman... Doomsday... all while demanding that Superman say his true name. Finally, Superman realizes who they are dealing with. Mister Mxyzptlk. Once again Superman demands that Mxy return his son but after taunting Lois and Superman some more the imp disappears. Superman is angry but soon realizes that Lois is acting strangely. Suddenly she doesn't remember Mxy or, more importantly, their son Jon. Story - 5: Well... I did not see that coming at all. I really didn't. To be fair I wasn't putting too much energy into figuring out who DoppleClark was. I seem to have lost that part of my fandom that tries to figure out what's going on with a story or character ahead of a big reveal. Lately I've been happy to let the story unfold as it does, so when the theories about who the Other Clark could be started popping up on social media and comic hype sites I didn't pay much attention to them and now I'm glad I did because the revelation that DoppleClark was Mister Mxyzptlk was glorious and gave me that charge I used to get when a comic would hit me with a huge reveal. This was like finding out that the Cyborg Superman was Hank Henshaw and the fact that Dan Jurgens was involved with both of those comics did not escape my attention. 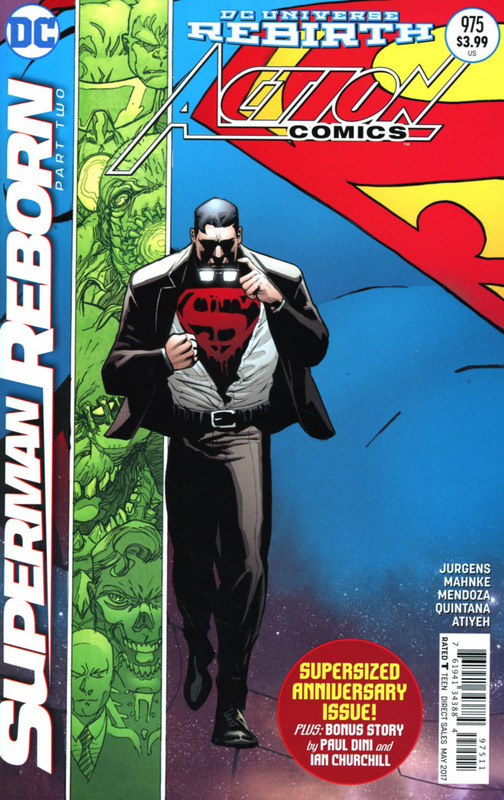 It could be argued that this chapter of SUPERMAN REBORN was mostly filler because the bulk of this story is Superman going through the greatest hits of his villains before Mxy finally makes his proper entrance. It's a fair critique but ultimately, I disagree with it. 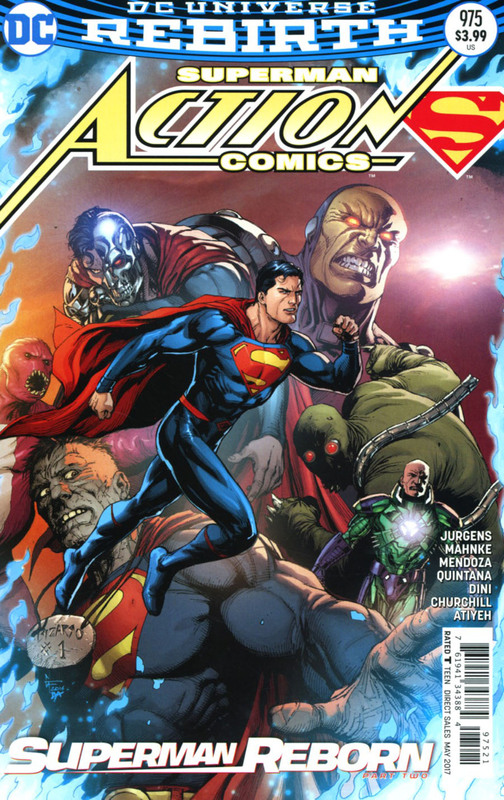 For one thing, I liked seeing Superman facing off against Lex and Brainiac and the like. We haven't seen these villains much in the past five or so years with some of them going to other titles while others appeared but were handled poorly. Watching Superman trip-hammer through his rogues gallery added to the sense that this story was about getting Superman to a more classic while still contemporary space. It seems like DC recognized there was a problem but instead of putting a small bandage on a gushing wound they are slowly stitching the wound back together and letting it heal at a natural pace which will hopefully mitigate any scars. The story was also moody with another great cliffhanger. The interest in this story that I've seen on social media has been earned and Jurgens continues to earn that interest here by delivering another jaw dropping ending. Having Jon disappear at the end of the first chapter and then having Lois forget him here is a pretty natural course for this story to take but it does make getting the next chapter as soon as it comes out non-negotiable. Mister Mxyzptlk. Bravo to the creative teams for thinking outside the box on this one. Art - 5: Mahnke never missed a beat in this issue. His style was perfect for the moodiness of the beginning of the story and he stuck the landing with every full-page splash of Superman fighting the different members of his rogues gallery. The ultimate reveal of Mxyzptlk was amazing and it was neat to see two Superman creators that were contemporaries back in the nineties finally get to work together today. I used to be down on Mahnke's art but that's all behind me. It was great to see him work on this issue. "The Man in the Purple Hat"
Mr. Mxyzptlk holds Jon in a special place outside of time and space. Jon tells Mxy how his father used to talk about Mxy as part of his bedtime stories. Jon couldn't say the words "purple hat" so it would come out Ruppletat. In turn Mxy explains what happened to him. While returning to Earth for his quarterly appointment with Superman Mxy was taken captive by Mister Oz. Oz had plans for Superman and Mxy might prove to be trouble so Oz will keep Mxy captive until those plans are concluded. Mxy is sure Superman will come looking for him but he never did. Eventually Mxy said his name backwards enough times to escape but he needed a disguise. He assumed the form of Clark and put a whammy on himself to make him forget who he was. After seeing Jon and Clark and Lois together Mxy finally remembered. He allows Jon to think he's escaped but then reveals that he is still a captive until Superman can find him. Mxy used the same sneaky trick that Superman used on him for years. With that Mxy summons a deck of cards and asks Jon if he has any fives. Story - 5: Despite only writing a handful of his stories Paul Dini is one of the main people I think of when it comes to Mxyzptlk. Such is the power of his appearances on SUPERMAN: THE ANIMATED SERIES. Dini doesn't disappoint here and because he has such a good handle on Mxy I didn't mind that the editors brought in an outside creator to write the story that explained why the imp was doing what he was doing. It doesn't hurt that I felt bad for Mxy and appreciated that he assumed Clark's form out of a feeling of abandonment. To be fair I believe Mxy thinks more of his relationship with Superman than Superman does but that doesn't mean that I didn't have some pity for the character as he told his story. I also like the metatextual elements of this story. Seeing elements from past versions of the character, both in the comics and in other media was neat and played with the fact that Mxy is a being from another dimension and not limited by the comic book world. Jonathan was treated as a very capable character and I liked that even though he ultimately failed to outsmart Mxy he gave it his best shot. This back-up story was an elegant way to allow the main story to have a dramatic reveal and not bog it down with exposition while also allowing the next chapter to hit the ground running. It gave us all the information we needed at this point and furthered the sub-plot of Mister Oz being up to no good and making some trouble in the neighborhood. Both stories made for a very satisfying issue and a great way to mark a milestone issue number. Art - 5: Ian Churchill did not disappoint in this story. Not only did he make two characters talking dynamic and engaging but the way he mimicked other art styles was nothing less than amazing. His take on Mister Mxyzptlk was whimsical while still being creepy at the same time. Churchill made the story of how Mxy became DoppleClark visually interesting and combined with the writing it took an expositional story and made it a page turner. Cover Art - 5: I'm a sucker for covers that link with other covers. This one is creepy and I liked that the bleeding S made me think one thing while the inside of the book took a completely different turn. The green panel of the villains made for a nice tease as well. Variant Cover Art - 4: The villains look amazing on this cover but there is something a tad off about Superman. He seems a bit stiff and the proportions seem off. That might have shaved off a few points but this is still a really neat variant cover.